If you have been playing guitar for any amount of time past a month or 2 you will start to get tired of playing the same things all the time. Everybody goes through this and we will look at how to overcome this. Are you tired of learning and practising dull and lifeless exercises that don't really work? Frustrated with scale patterns that get you to run up and down the strings but don't sound close to a musical idea? Do you jump around from one idea to the other hoping to see improvements in your playing but at the end of the hour you feel like you haven't got anywhere? You're not alone. For nearly two decades my guitar practice consisted of basically what I felt like doing in the moment or learning songs that my band wanted to play. So I know how you feel – you want to play more and progress faster and feel a sense of accomplishment and inspiration of being a better guitar player. In this short article I want to share with you some things that really helped to turn my practice sessions around. I'm sure if you follow this advice you will get inspired to practice more and advance faster. Make you practice area unique and inspiring to you. You are going to be spending a lot of time here so make it a dedicated part of your house. Have it set up with a good armless chair, a footstool and music stand. Have you amplifier nearby (if you play electric guitar) ready to go. On your walls, put up posters or photos of your favourite guitar players or bands. Use album covers for added inspiration if you want. You can also include inspirational/motivational quotes on you walls to fire you up and to keep you focused. Having your practice area, designed and set up the way you like it, will greatly aid to your inspiration to practice more. Before you sit down to practice for the day or particular session make sure you have all the materials you are going to be learning/practising/reviewing on hand ready to go. Have the music sheets, guitar lesson handouts or books beside you at all times and ready to go so you don't have to waste your precious practice time, shuffling and rummaging through books or folders to find what you are practising. This alone will save you time and make your practice sessions way more productive and rewarding. It will also eliminate the urge to just wander and start noodling. Before you practice, tell everybody you live with that you're not going to be available for the next thirty to sixty minutes. Tell them that you are not to be interrupted during this time unless in case of an emergency. You also want to switch off your phone. Jumping from one thing to another in any random order, or spur of the moment is not practising. It's noodling. And noodling doesn't get you results. It leads to just playing around on your guitar. And playing around on your guitar doing things you can already do is not practising. To overcome and prevent this from happening, set up what you want to practice and achieve for the week, before you ever sit down to a single practice session. This can be as simple as “I want to learn these two new chords and to change between them smoothly by Saturday”. When it is written down it gives you direction, something to aim for. Your goals for the week should include most areas of your guitar playing. Write down one goal for chords, notes/scales, rhythm and songs. Seeing this written on paper will keep you focused and organised to practice with more determination and discipline. What does this mean make your commitment? We all live busy lives. We have other responsibilities to consider besides learning guitar. With these other things wanting and needing our time it’s easy to let guitar practice slide and dismiss it off with a 'well, this came up' attitude. However, things do come up from time to time that prevents us from doing our practice. That's life. However we need to dedicate time to our practice. To see improvements in your playing week in and week out you have to schedule your practice time in. Write it down as not negotiable. Commit to this time daily. Even if it can only be 10minutes a session down several times throughout the day. If you don't schedule it you'll find your guitar practice at the mercy of 'other things'. The five things above call for no real sacrifice. They're not hard to do. However once you start doing them you will see continued results in your guitar playing. Each week the thing that was once hard to do gets easier to play and allows you to tackle more challenging songs and material. Now that's inspiring. Allen Hopgood grew up on a steady diet of Australian rock music. Having played in bands since he was 15, he has shared the stage with some of the elite Australian musical talent. 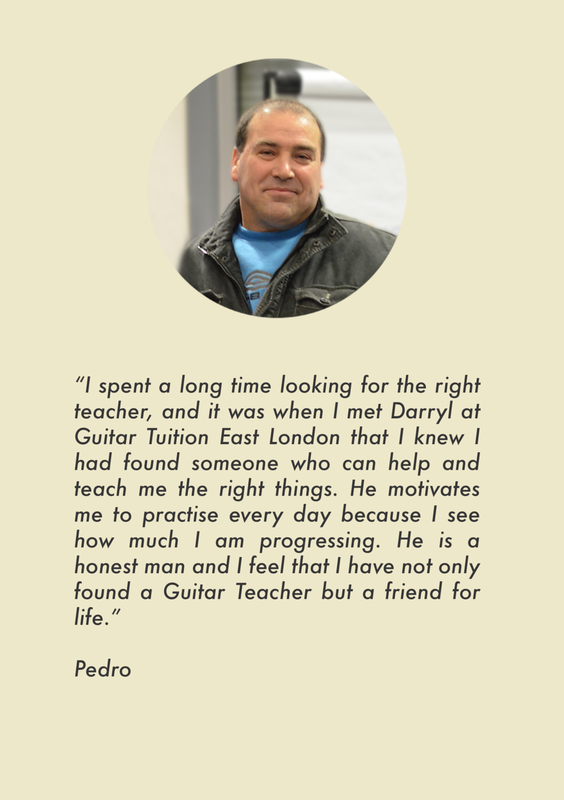 Living on the Gold Coast, he runs a successful guitar teaching business while pursuing his passion of song writing.